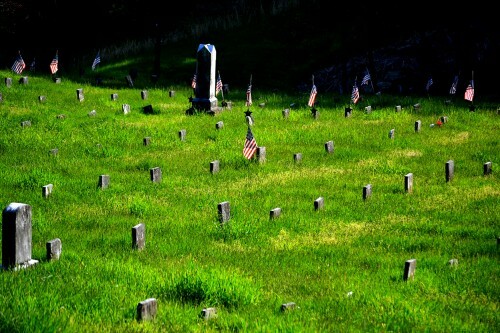 Eighty veterans are buried in the three cemeteries that served The Ridges, formerly known as the Athens Lunatic Asylum. 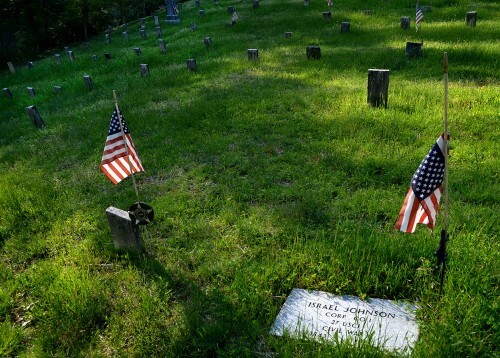 Curator Jessica and I were fortunate enough to quickly find the graves of two men who served in the United States Colored Infantry in the Civil War. 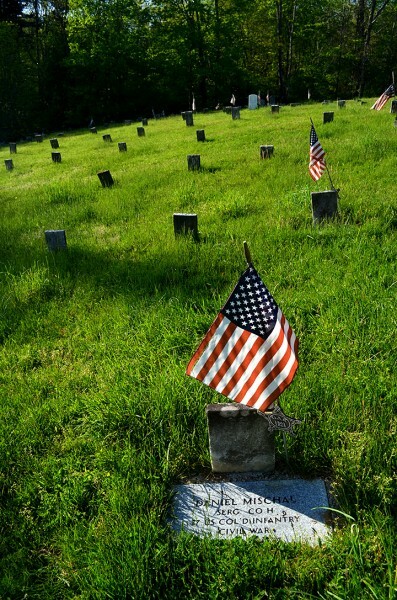 Daniel Mischal was a sergeant in the 27th United States Colored Infantry, Ohio’s second African American regiment. The regiment was organized at Camp Delaware on January 16th, 1864, and served until the end of the Civil War; it was then mustered out September 21, 1865. Here is the grave of Corp. Israel Johnson. A visitor’s guide to the cemeteries says “Virtually everything about burial on the Ridges was austere. The unembalmed bodies were washed, wrapped in simple shrouds, and placed in plain wooden coffins. Normally, the funeral “procession” was comprised of six people: four gravedigger/pallbearers, a representative of the hospital and a chaplain. 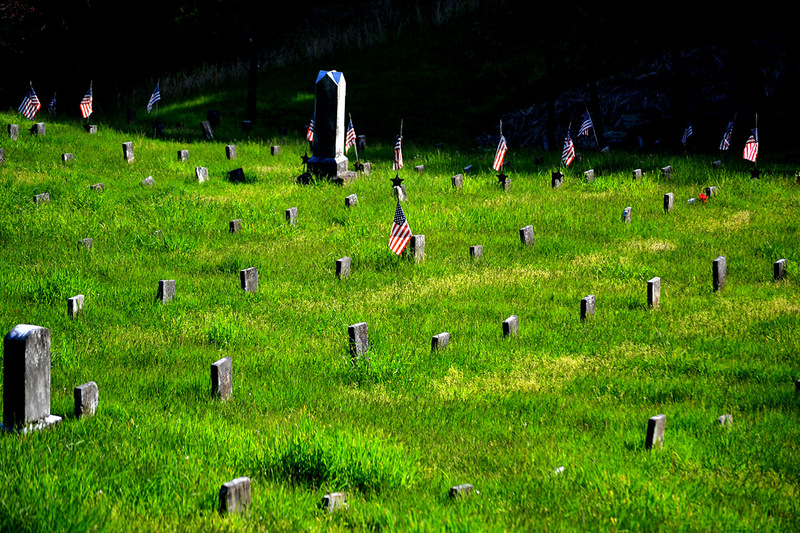 This particular cemetery served the Asylum from its opening in 1874 until about 1913, so the flags you see flying recognize servicemen who fought before World War I. Two other cemeteries on the property received bodies until 1972, After that, unclaimed bodies were taken to two rural Athens County cemeteries. 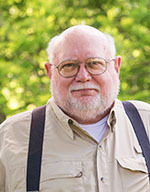 In all, the National Alliance on Mental Illness (NAMI), which has taken on the task of identifying the graves of veterans, has found two who fought in the Mexican War, sixty-eight from the Civil War, a member of the Confederate Army, and another two veterans who served with the United States Colored infantry. Three veterans served in the Spanish–American War, and seven fought in World War I. 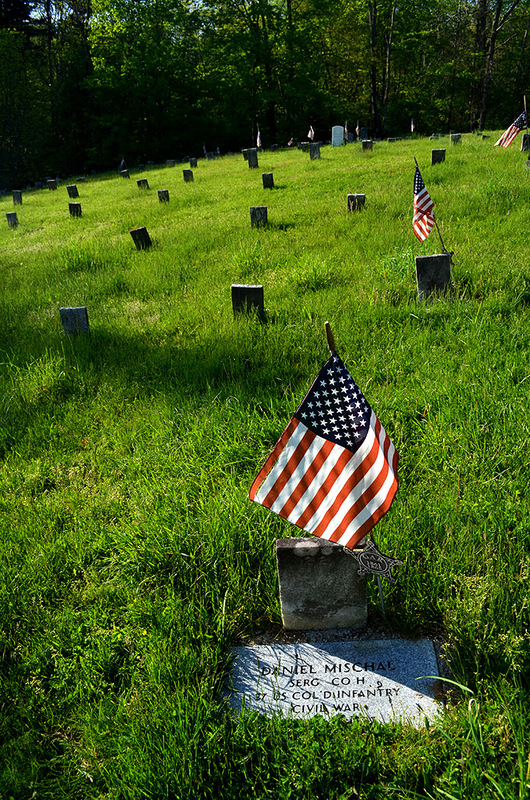 Starting in 2005, the Ridges Cemeteries Committee has been organizing Memorial Day Ceremonies for the many veterans buried at the asylum. 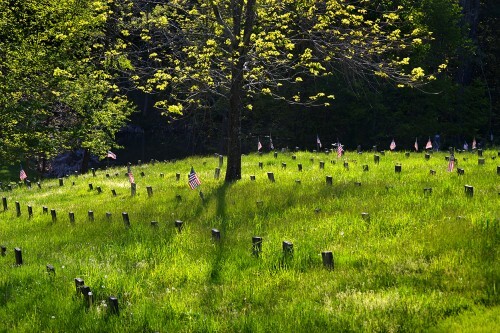 NAMI started the Memorial Day Ceremonies to help restore dignity to the patients on the Ridges and to help recognize the sacrifice of the veterans, many who had probably suffered through post traumatic stress disorder as well as other post war symptoms.